SACRAMENTO - Demonstrating California’s progress toward a clean-energy economy, the California Air Resources Board today released the latest statewide inventory of greenhouse gas emissions, a report showing significant emissions reductions along with the strongest economic growth since 2005. The 2015 Greenhouse Gas Emissions Inventory, released today by CARB, found that climate-warming emissions fell by 1.5 million metric tons (MMT) in 2015 compared with 2014, which is equivalent to removing 300,000 vehicles from California’s roads for a year. California, the sixth-largest economy in the world, has advanced its nation-leading climate goals while also growing the economy. In the last seven years, California has created 2.3 million new jobs – outpacing most of the U.S. – cut its unemployment rate in half, eliminated a $27 billion budget deficit and has seen its credit rating rise to the highest level in more than a decade. In 2016, California led the nation in job creation for the third straight year. The California Global Warming Solutions Act (AB 32) set a target of reducing greenhouse gas emissions to 1990 levels by 2020, which equals about 431 million metric tons. Last year, the Governor and the Legislature established a 2030 target of an additional reduction of 40 percent below 1990 emission levels – the most ambitious goal in North America. The new data shows that California is on its way to meet these targets. Since the peak of 489 MMT in 2004, statewide emissions have declined by 10 percent, with the latest inventory showing emissions of 440 MMT in 2015. California’s primary programs for reducing greenhouse gases to 1990 levels are the Renewables Portfolio Standard, the Advanced Clean Cars Program, the Low Carbon Fuel Standard and the Cap-and-Trade Program. Additional programs address a variety of greenhouse gas sources, from cleaning up freight movement to reducing potent super-pollutants. The continuation of these programs will be key building blocks in California’s efforts to achieve its 2030 target. 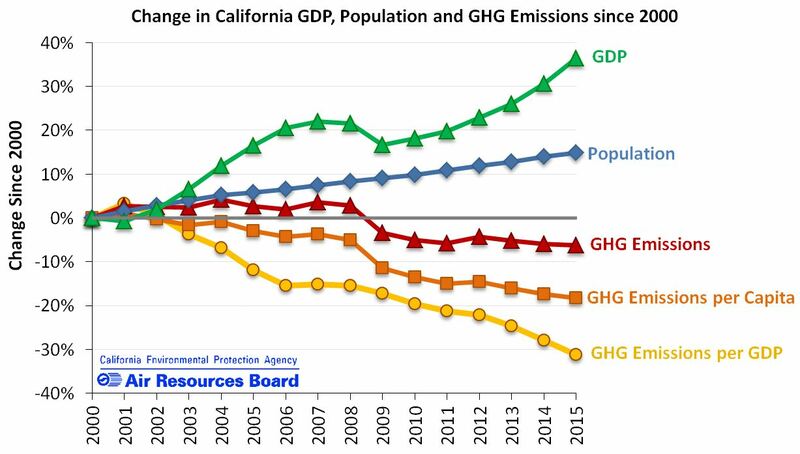 The 2015 Greenhouse Gas Emission Trends Report released today also shows that the carbon intensity of the California economy – the amount of greenhouse gases needed to generate each million dollars of gross state product (GSP) -- has fallen 33 percent since its peak in 2001. During the same period, the state’s GSP has grown by 37 percent. Emissions from most major economic sectors declined in 2015, with the exception of transportation, the inventory shows. The energy sector saw emissions from both in-state and imported electricity generation fall by more than 5 percent from 2014 levels. This continues a steady decline in the carbon intensity of California’s electricity supply that began in 2001. This trend is likely due to energy efficiency improvements, growth in renewable energy, and the Cap-and-Trade Program. Emissions from industrial sources declined or leveled off. Refinery emissions dropped by 4 percent in 2015, and, despite a surge in construction and highway repair, emissions from the cement sector remained stable in 2015. Increased fuel consumption in 2015 resulted in a 3 percent increase in emissions from the transportation sector, which is the state’s largest source of greenhouse gases with 37 percent of statewide emissions. As a result of the state’s Low Carbon Fuel Standard, however, cleaner renewable fuels are continuing to replace gasoline and diesel fuels. In 2015 biofuels displaced more than one billion gallons of gasoline and over 300 million gallons of diesel fuel. CARB is developing a 2030 Scoping Plan to guide greenhouse gas reductions beyond 2020. In addition to the programs already mentioned, the Short-Lived Climate Pollutants Strategy, the Sustainable Communities Program and the Sustainable Freight Strategy will help the state achieve the 2030 target. The 2030 Scoping Plan lays out how these initiatives will work together to reduce greenhouse gases and also to reduce smog-causing pollutants. All the greenhouse gas emission numbers above are stated in million metric tons of carbon dioxide equivalent (CO2e). Scientists use carbon dioxide as the benchmark in comparing the potency of heat-trapping effects among all greenhouse gases. Consistent with international and national greenhouse gas inventory practices, global warming potential in a 100-year timeframe is used in the inventory. You can find the 2015 Greenhouse Gas Emissions Inventory data here. The Trends document that examines the current Greenhouse Gas Inventory from the perspective of previous Greenhouse Gas Inventories is here.